Back in 1996 a group released a monumental record in underground hip hop entitled Clear Blue Skies. It was released solely on vinyl, soon sold out and copies were found on ebay going for bids of $50 and up. Smartly, the Juggaknots decided to reissue the album that put them on the map complete with twice as many songs as the original. If you weren't around to witness them the first time around (or now the second), please do yourself a favor and grab this before you miss it again. Re-issued courtesy of Amalgam Entertainment. Produced by The Juggaknots except: 12 by Chris 'Suga Shadow' Liggio, 6, 7, 10 & 15 by B-Slim, 4 & 7 by Breezly Brewin, 8 by The Obvious Wonder. Tracks 2, 5, 9, 11, 14 & 20 co-produced by Chris 'Suga Shadow' Liggio. Violin on 11 by Ron, Guitar on 11 by Bernard Grubman, Guitar solos on 16 by Rich Keller. 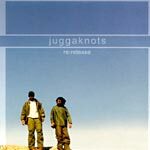 The Juggaknots provide nothing less than amazing hip-hop. Breezly Brewin is one of the illest emcees to touch a microphone, and their production is and always will be raw and original. It's so good to hear this record again. Timeless HEAT!